James Roy Horner (August 14, 1953 – June 22, 2015) was an American music director. He scored the music for the 1997 movie Titanic. He won two Academy Awards in 1998. Horner was born on August 14, 1953 in Los Angeles, California. Horner was killed in an airplane crash near Los Padres National Forest, California, aged 61. Horner also won two Golden Globe Awards, three Satellite Awards, and three Saturn Awards. He was nominated for three British Academy Film Awards. In October 2013, Horner received the Max Steiner Award at the Hollywood in Vienna Gala. That award is given for extraordinary achievements in the music for movies. ↑ Clemmensen, Christian. 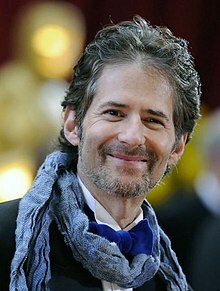 "James Horner (1953-)". Filmtracks.com. Retrieved 21 May 2012. ↑ 2.0 2.1 Burlingame, Jon (June 22, 2015). "James Horner, Titanic Composer, Dies In Plane Crash". Variety. Retrieved June 22, 2015. ↑ Finn, Natalie (June 22, 2015). "Titanic Composer James Horner Missing After Plane Registered to Oscar Winner Crashes, Killing the Pilot". E!. Retrieved June 22, 2015. This page was last changed on 28 January 2019, at 09:49.